Continuum is designed by Simon Collison and is a Magazine theme which features a custom homepage, custom typography and some extra custom widgets, all to help your news/magazine website get a stylish and functional look. 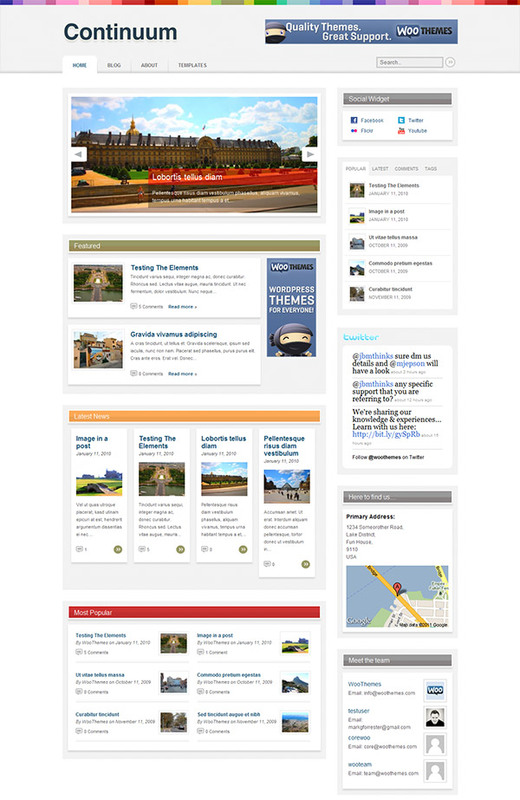 The homepage contains a Slider, Featured panel, Latest News and Most Popular panel. All are optional and can be setup in the options panel. You can customize the general typography, and there is full support for Google Fonts in the font selector. 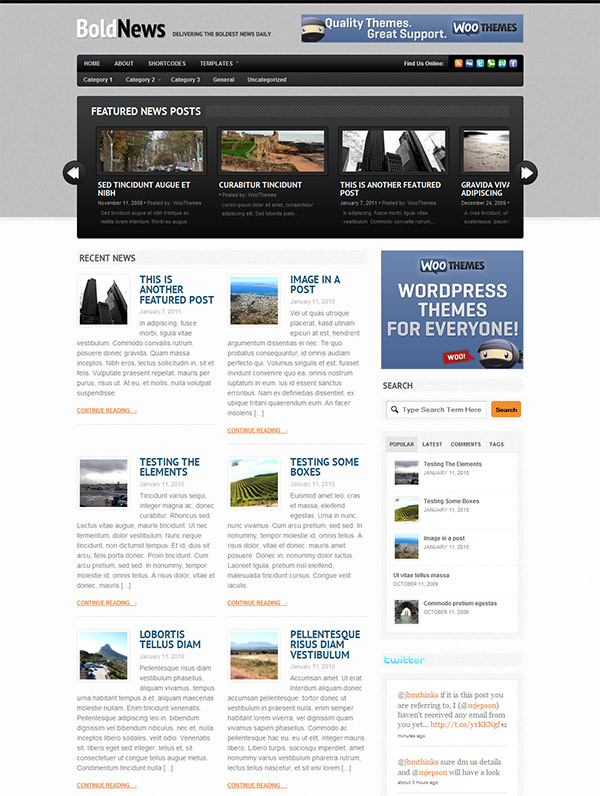 The theme has 3 widgetized areas in the footer, and one widgetized sidebar, and as always comes with custom Woo Widgets (Ad Space, Blog Author, Embed, WooTabs, Search, Flickr, Twitter, Feedburner, Campaign Monitor, Social, Address, Authors). The theme includes 7 alternative color styles which you can preview in the demo, and also has styling options for background color/image and setting link color. Making simple changes without editing code, like adding your own logo, changing to an alternate color style, adding Google Analytics code, couldn’t be easier with the theme’s backend options panel. The theme is tested to ensure it is compatible with all the modern web browsers like Firefox, Safari, Chrome and Internet Explorer. An image resizer script is built into the theme framework that automatically scales your post images for pixel perfect display in the template. 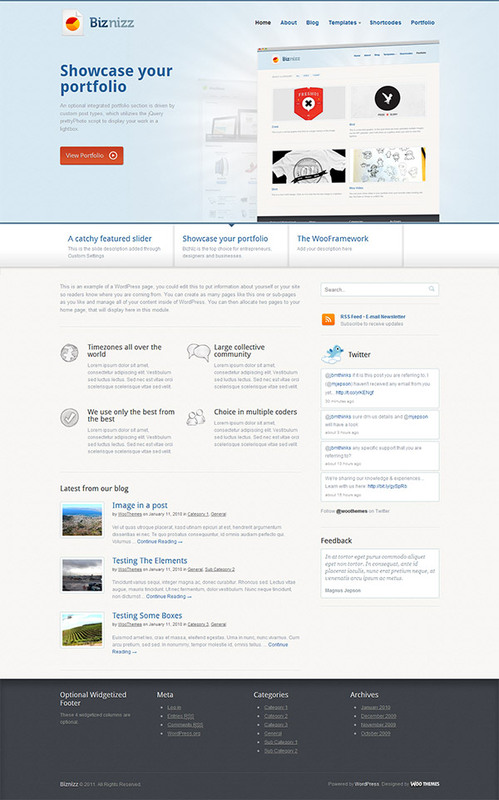 No need to upload new cropped images when re-designing your website. It also comes packaged with a .po file for easy WordPress theme translations into your desired language – editing one neat little file without hunting down text in all our theme templates.